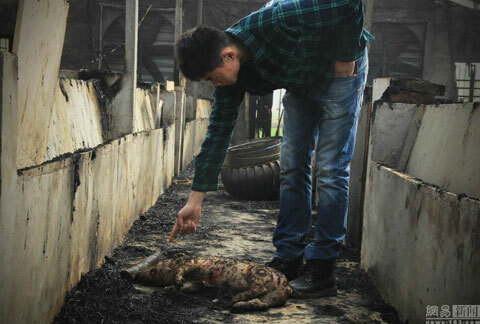 The owner of the farm estimates that the fire cost him between 40,000 RMB and 50,000 RMB ($6,000 and $8,000) in losses. Over 300 pigs were incinerated at a farm in Anhui province, China after a neighboring resident was lighting off firecrackers that sparked a flame in the hog pen. 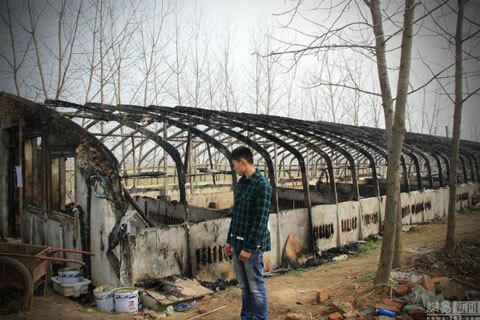 The fire occurred on the eve of the lunar new year after a villager set off a string of firecrackers while visiting the grave of his ancestor adjacent to the farm, reports Shanghaiist. Pigs are intelligent animals, a fact that makes this catastrophe even more upsetting. If only the fire broke out at one of China’s many cockroach farms. The entire farm was damaged by the fire; only a skeleton of the structure remains.